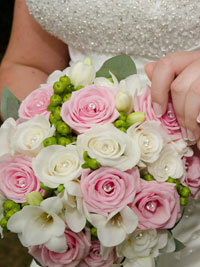 Sam chose a pretty colour theme for her summer wedding flowers including pale pink, ivory and lime green. In her bouquet (photo below) you can see how I added diamante pins to the centre of the roses to match the sparkly detailing on the bodice of her wedding dress. Her handtied posy bouquet featured a soft pink rose called ‘Heaven’, ivory roses, freesias, lime green hypericum berries to pick up the colour of the bridesmaid’s dress and eucalyptus leaves. The freesias and eucalyptus gave the bouquet a delicate summer fragrance. Sam’s bridesmaid wore a pale green dress and her bouquet featured ivory roses, freesias and delicate splashes of lime green from the hypericum berries. Beautiful silver green eucalyptus leaves surrounded the bouquet. The colour theme was taken through to all of the wedding reception decorations including the tall wedding centrepieces. I used all the flowers from the bridal bouquet as well as white Singapore orchids to decorate our beautiful silver candelabras. Candelabras look stunning at any time of the year and candles are always so popular with our brides as they add a romantic touch to the tables. Sam’s summer wedding flowers look really pretty on the silver candelabras. In the photos above you can see them on the round tables in the Rose room at Ansty Hall. 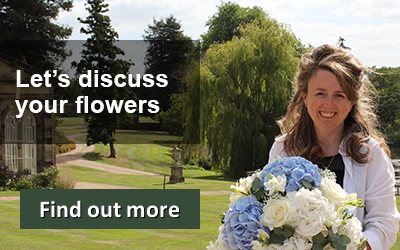 We have been producing wedding flowers for brides at Ansty Hall for over 8 years. The rose room and the Orangery have French doors onto the garden, which is wonderful for summer weddings. For the wedding cake I made a topper using roses, freesias and hypericum berries, these toppers are a great way to decorate a wedding cake. 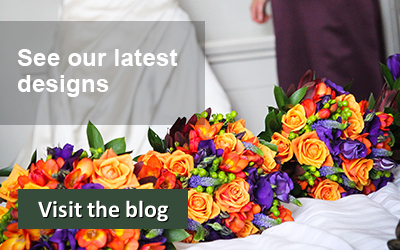 They add your colour and wedding flower theme without detracting from the wedding cake. I love the way Sam has placed her bridal bouquet next to the cake during the wedding breakfast. Placing your bouquet next to the cake gives you another opportunity to have your bouquet photographed as well as providing a decoration for the wedding cake table.